Crosshue Boy was a winner at this meeting 12 months ago when beating Alan King’s Dingo Dollar, one of the favourites for the Ayr marathon. While his trainer Sean Doyle only has two horses in his care, he has been planning his return trip to Scotland for some time. “He won at the meeting last year and this looks a wide-open Scottish National, he’s going there with every chance,” said Doyle. Hopes for the home team rest with Big River, trained by Lucinda Russell, fourth in the Cheltenham race won by Beware The Bear, and Sandy Thomson’s lightly-raced Geronimo ridden by Rachael McDonald, who is attempting to be the first female jockey to ride the winner of a Scottish National. 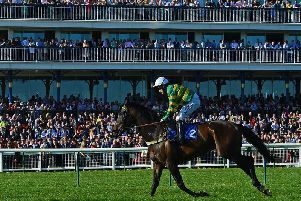 With a sell-out crowd of 18,500 set to watch the eight-race card, the main supporting contest is the CPMS Scottish Champion Hurdle in which Henderson has the top three rated – Verdana Blue, ridden by Connor Brace, Brain Power (Aidan Coleman) and Mister Fisher (Nico de Boinville). Meanwhile, trainer Dan Skelton made it a hat-trick of wins in Ayr’s feature race of the opening day of the meeting when Born Survivor won the £50,000 Hillhouse Quarry Handicap Chase at odds of 100-30 with Dan’s brother Harry Skelton riding. The eight year-old pulled clear to beat Sizing Granite by seven lengths. Skelton won the race with Two Taffs in 2017 and Value At Risk in 2018. Value At Risk came in third and Skelton also won the following race when Peppay Le Pugh landed the two mile novices’ chase with Harry in the saddle again. Borders-based trainer Harriet Graham saddled Aye Right, ridden by Callum Bewley, to win the three mile handicap hurdle by three and a quarter lengths from Before Midnight. One of the best backed horses of the day was Yeats (11-4 favourite) who won the Smart Money’s On Coral Seafield Trophy Mares’ Handicap Hurdle for Irish-based trainer Emmet Mullins.